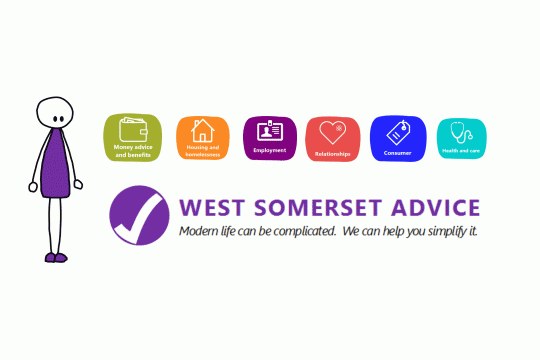 West Somerset Advice exists to provide free and independent advice of the highest quality, across a broad range of matters to residents in West Somerset towns and villages. Volunteers advisers, supported by a small team of part-time specialist staff, provide advice across matters as diverse as debt, housing and homelessness, employment, welfare benefits/income maximisation, family and relationship matters and consumer issues. Much of the work of the service is centred on relieving financial exclusion and helping the most vulnerable in the community. Our income maximisation work dramatically improves lives for both young and old.Reduced financial stress improves the health and well-being of individuals, reducing levels of depression and other stress-related illness, helping to save public money ie NHS. Financially stable households enjoy a better quality of life and play a more active role in the community. Through its advice work last year we raised £750,000 for clients in benefit entitlements, debt written off. By close partnership working, we prevented homeless and helped people deal with unfair treatment by traders, employers and the DWP. We achieved positive outcomes for and 98% of people rated our service as excellent. Those with time and an interest in helping others is all that's required. Training will be provided.We offer our main service from our centre in Minehead, but also run outreaches. If you live in West Somerset contact us to find out more.